This is a ridiculously easy and surprisingly delicious one dish recipe that’s perfect for a night when you don’t have a ton of time or energy. It’s relatively simple, ingredient-wise, too. We just used onions and carrots, but the original recipe includes potatoes, which I left in below. Mix together the red wine, tomato paste, herbs and red wine vinegar. Season the chicken pieces with plenty of salt and pepper then place in a bag with the marinade. Shake the bag to make sure each piece is well coated. Place in the fridge for at least 30 minutes. In the meantime, place the potatoes in a pan of cold water, put the lid on top and bring up to the boil. Boil for 1–2 minutes, then drain in a colander. 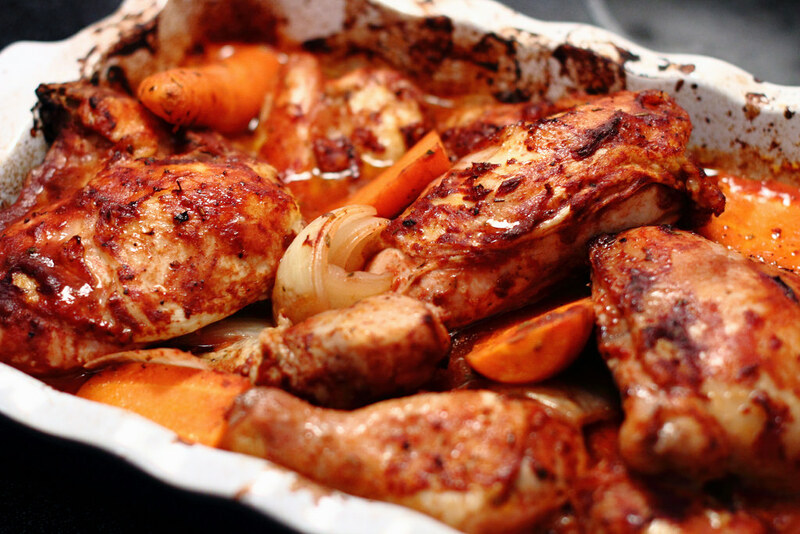 Place the onions, carrots and potatoes in a large baking dish or tray (big enough to fit the chicken and the vegetables) and pour over 1/2 cup of water. Preheat the oven to 400°F. Remove the chicken from the fridge and arrange the pieces, skin side up, in a layer on top of the vegetables in the dish. Pour the rest of the marinade over the chicken. Cover with a sheet of baking paper or foil and roast in the preheated oven for 30 minutes. Remove the baking paper or foil and baste the chicken with the cooking liquid. Roast, uncovered, for another 15 minutes or until the skin is crisp (I roasted it an additional 15 minutes). Serve warm and drizzle generously with sauce. wish we all could taste it right now!